Isn't it crazy to think that fashion of years past (and if you're a Kardashian), included corsets to create an hourglass silhouette? Wild. You hourglass figures are the envy of almost all women, but it doesn't mean that dressing your figure is a snap—we know! 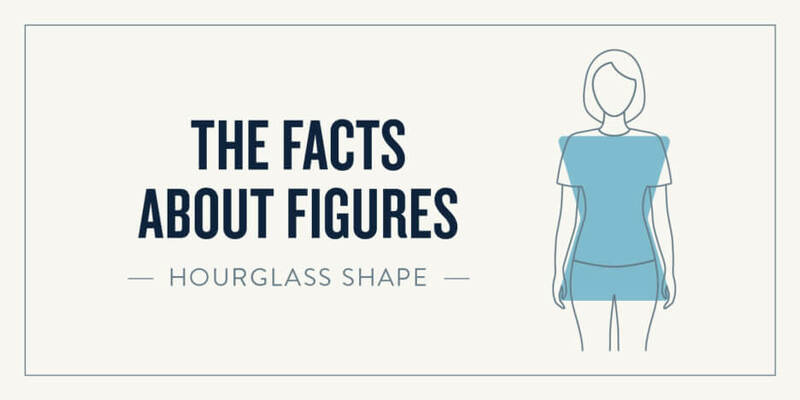 No matter what features you want to flaunt (or hide), this simple, 5-step guide to help you on your own path to learning how to dress your hourglass figure. So, what’s an hourglass shape, anyway? The key to dressing an hourglass shape is two-fold: 1) define your waist and 2) show off your lovely lady shape. You have amazing curves—it’s time to embrace them in body-hugging silhouettes and pieces that hit you in all the right places. Get started with these guidelines to embrace your hourglass shape. 1. Start from the top! The hourglass shape is the perfect shape for structured, more tailored silhouettes. And, the beauty of this shape is that your curves are already very balanced. Everything from your most basic pieces (like casual tees!) to your button-up workwear blouses should be fitted to show off your narrow waist. You can enjoy lots of flexibility when it comes to sleeve length! Want to draw the eye to your waist? Try elbow-length styles. Love to show off your arms? Try a cap sleeve, flutter sleeve or even a tank top. Look for jackets that show off your waist! A classic trench, fitted blazers, cropped silhouettes and bomber jackets with elastic waistbands look amazing on you. Beware Of: Boxy styles—they won’t do your curves justice. Instead, focus on silhouettes that draw the eye to the most slender part of your frame. The hourglass figure was made for dresses. Channel your inner Monroe and reach for iconic silhouettes like the wrap dress or the fit & flare. These shapes will naturally play up your best features. If you’re looking for something new, an empire silhouette also works wonders. Why? They highlight your natural waist. Beware Of: Flowy styles. If you love a dress and it’s a trapeze or other loose-fitting silhouette, simply add a belt. In fact, as a general rule—when in doubt, belt it! As far as hemlines go, take your pick! If you love your legs, reach for that mini. If you’d like to cover up a bit more, look for high-waisted skirts that hit right below the knee. For the lovely hourglass shape looking to downplay their curves (why would you? ), choose very simple silhouettes in solid, dark colors. Grab your high-waisted, floor-grazing flares and your favorite dancing heels. If you love your flat stomach, then you can pull off more daring low-rise hip-hugging styles (which look amazing with a slightly cropped or very fitted top). Stretchy skinny jeans and leggings are perfect for showing off the curves of your hip and the taper of your leg, and work best when the inseam is a regular (not cropped) length. Fitted jumpsuits (so on-trend!) can look incredible on you. Just remember to go for waist flattering styles. Because your shape is so balanced, remember that you won’t need any extra details (like large seams or cargo pockets) to accentuate your hips. Skinny waist belts are your best friend! Necklaces look great on you, and if you’re looking to play up your bust, choose a length that hits at or slightly below your collarbone. Purses and clutches that have a little structure can offer a nice juxtaposition to your soft, flowy curves. Everybody and every body is different. If you’re not an hourglass shape through and through, think of mixing and matching shapes to find the right fit for you. These dressing guidelines are best used as a starting point!